Pimsleur® equals success. Just one 30-minute lesson a day gets you speaking and understanding like no other program. This course includes Lessons 1-16 from the Norwegian Level 1 program - 8 hours of audio-only effective language learning with real-life spoken practice sessions. Each lesson provides 30 minutes of spoken language practice, with an introductory conversation, and new vocabulary and structures. Detailed instructions enable you to understand and participate in the conversation. Practice for vocabulary introduced in previous lessons is included in each lesson. Topics include: greetings, numbers, meals, shopping, telling time, scheduling activities, and asking and giving directions. The emphasis is on pronunciation and comprehension, and on learning to speak Norwegian. Readings begin in Lesson 11. Norwegian, the official language of Norway, is spoken by approximately 5 million people, primarily in Norway. There are a great number of dialects spoken in Norway. 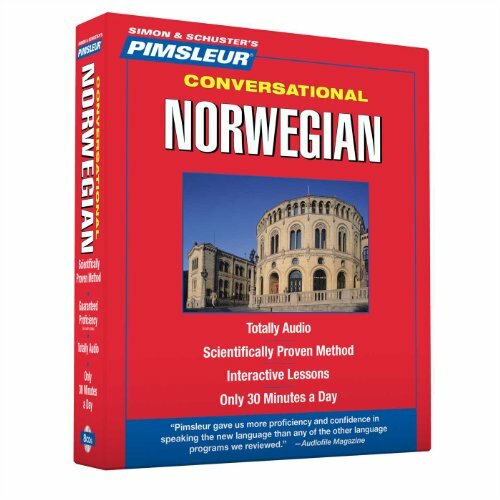 Pimsleur's Norwegian closely adheres to the pronunciation of the inhabitants of Oslo, the capital of Norway. Norwegian, along with Swedish and Danish comprise a trio of mutually intelligible Scandinavian languages. If you have any questions about this product by Pimsleur, contact us by completing and submitting the form below. If you are looking for a specif part number, please include it with your message.